The Rice Krispy Treat has been around for about 75 years and is celebrated as much for its distinctive flavor and texture as for the marriage of two completely different ingredients (proving opposites attract): crispy rice cereal and soft, chewy marshmallows. Together, these two ingredients form the basis of one of America’s all-time most popular snacks. Most of us remember our first attempts at baking, which more than likely included Rice Krispy Treats – with only two or three ingredients, the recipe was easy and the finished product scrumptious. The marshmallows would be melted in a big pot on the stove (usually with a bit of butter or margarine) and then combined with Rice Krispies. Stirring that goop and then getting it all out of the pot and into a greased pan was quite the challenge with the most fun part eating the warm marshmallowy krispies stuck to the pot. After placing the pan in the refrigerator for an hour, the treats were ready to be cut into brownie sized squares and then devoured. When people decide to stop eating products made from animals, they often think they have to forgo a lifelong favorite treat but not so with Rice Krispy Treats. 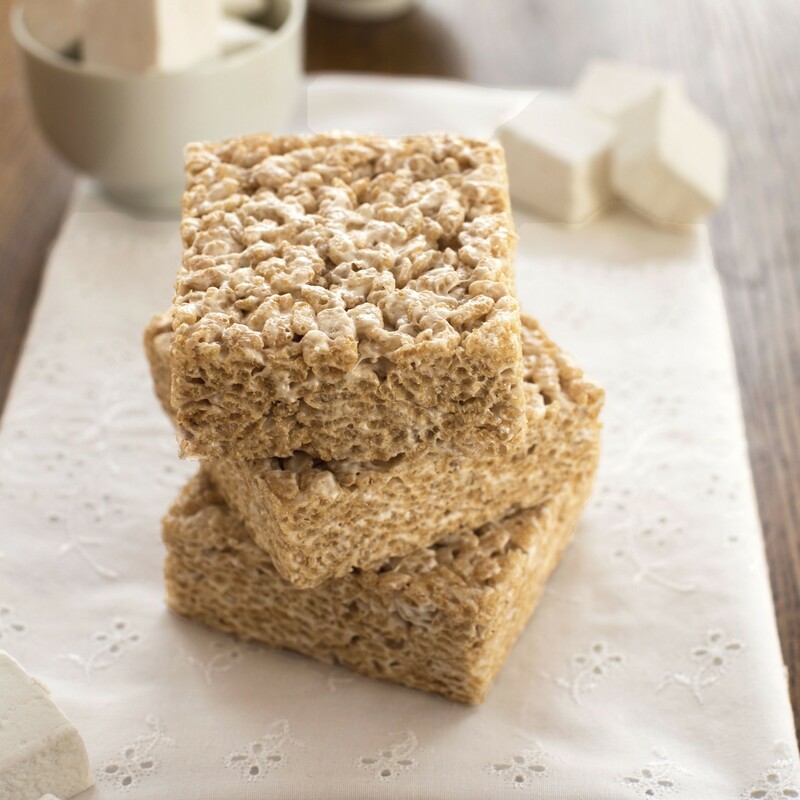 Sweet and Sara– a Long Island City, NY-based maker of scrumptious vegan treats – makes a vegan marshmallow (without gelatin garnered from animals) that she combines with crispy brown rice cereal to make one crunchy, chewy, delicious Rice Crispy Treat. Each Sweet and Sara Rice Crispy Treat is 1.5 ounces and individually wrapped for easy storage and transport. I keep mine in the refrigerator for a cool afternoon treat but the bars can also be packed in a purse or backpack. 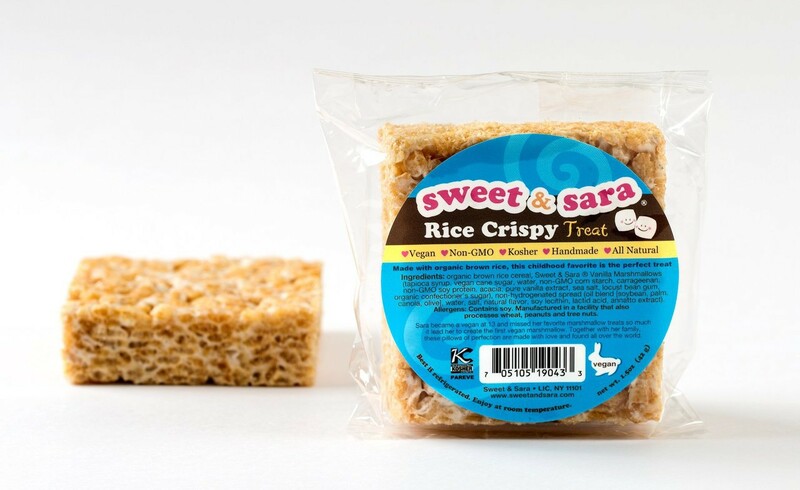 Kosher, vegan, certified non-GMO, and all natural, the Sweet and Sara Rice Crispy Treat is everything great about the classic treat without the animal products. Sweet and Sara Rice Crispy Treats can be purchased on-line directly from the company (www.sweetandsara.com) for $2.99 each or 12 individually wrapped treats for $28.69 ($2.39 each). 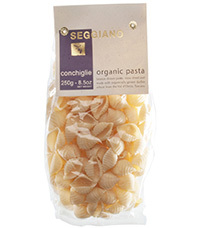 To find a retailer, use the locator service on the website listed above.